Student fight for noncompliance with attacks on immigrants, confront USF administration | Fight Back! 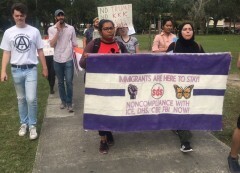 Tampa, FL - On November 20, students held a rally at the University of South Florida (USF) calling for increased protections for immigrant students. The event was hosted by Tampa Bay Students for a Democratic Society (SDS) as a part of their campaign, “Immigrants are Here to Stay,” to win noncompliance with federal agencies such as the Department of Homeland Security and its Immigration and Customs Enforcement (ICE), the Federal Bureau of Investigation, and Customs and Border Protection, that are charged with implementing attacks on the undocumented. The rally included speeches about the context of immigration to the United States and the Trump administration’s attacks on immigrants, such detentions and separations, militarization of the U.S. border, and the denials of asylum to the immigrant caravan. The tensions of this campaign came to a head when the students decided to march to the Patel Center, the base of administrative operations on campus, to meet with University President Judy Genshaft or Provost and Executive Vice President, Ralph Wilcox. “We have to defend immigrant students. They deserve to be here just like anyone else. Their legal status doesn’t detract from the fact that they’re human, they contribute to the economy, and they’re a part of U.S. society. Immigrant students deserve to get an education and other opportunities they wouldn’t necessarily receive in their home countries due to U.S. intervention,” said Tampa Bay SDS member Sanjukta Bhattacherjee. Even from outside of the building the students could be heard on the inside of the third and fourth floor of the Patel Center, as the police later confirmed. The volume and resolve of the students resulted in USF administration conceding. “We were able to get a meeting with the dean of students. We appreciate USF administration working with us, but we will not stop pushing for a meeting with President Genshaft and the provost to obtain a statement regarding USF’s compliance with federal immigration authorities,” said Tampa Bay SDS member Enya Silva.